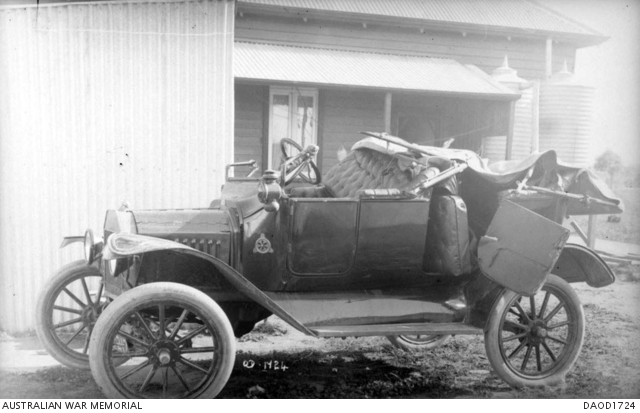 The caption doesn't tell us much, but it definitely is a WW1 car, and an AWM photo. Caption- "Portrait of McIntosh, broken down motor car." Thanks for posting. I suspect the car rolled over. Note the radiator neck is bent down and back. The windshield is down and back. Top is pulled off. And the left rear fender is pulled aft while the left front vender is pulled up and tucked under some. I have 1918 called “Donor” in my garage. If you are a car, it is a “bummer” of a name to have. But I purchased it for the parts. It had also rolled over and it has the appearance of minor damage to many parts – very similar to the car in the photo. The windshield damage is almost the same. In the case of the body on my car – it looks very good in a photo. But if you examine the body up close you can see where different wooden parts were damaged and will need to be replaced or repaired. It still amazes me that a car can be rolled and there is so little damage to the car. I suspect the top bows pushed the rear seat arm rest area down and the door opened during the roll – causing the additional damage to the rear door. Great photo of what looks like a new or nearly new 1915. With the left hand front functional door it has to be a Canadian or English Ford. The accessory air vent on the cowl is seen on some Canadian Fords from Australia. Australian. The car also has the fork mounted electric head lamps which appear to be standard for at least some and possibly all of the the 1915 Canadian produced cars. I looked but I did not find but a couple of 1915 English car photos and they did not show the style of headlamp -- post or fork. Does anyone have photos or documentation on the 1915 English Fords and what style of headlamp they used? And of course the photo is in archives of the Australian War Memorial (though some of the photos are English cars see: http://www.mtfca.com/discus/messages/506218/591995.html which was an English Ford) . Based on all the above, I believe it most likely is a Canadian car.